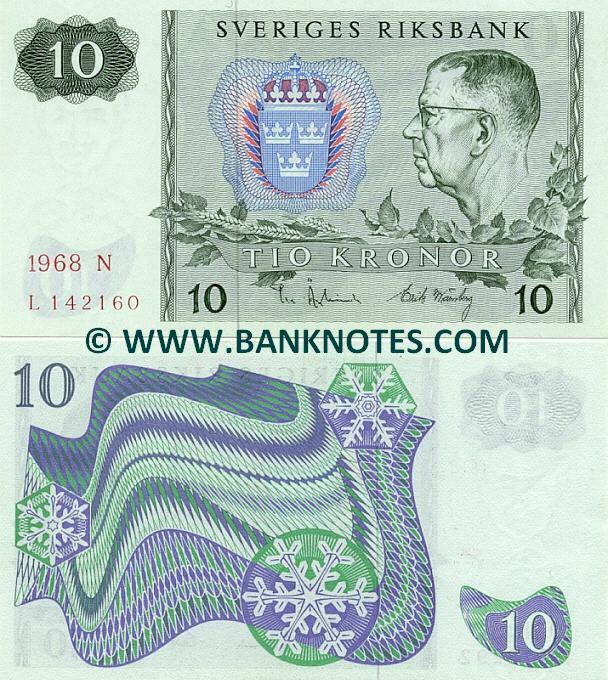 Sweden 10 Kronor 1963-1990 - Swedish Currency Bank Notes, European Paper Money, World Currency, Banknotes, Banknote, Bank-Notes, Coins & Currency. Currency Collector. Pictures of Money, Photos of Bank Notes, Currency Images, Currencies of the World. Obverse: King Gustaf VI Adolf (1950 - 1973). Coat of arms. Reverse: Stylised Northern Lights and snowflakes. 1955-1973); Erik Wamberg (Unknown). Dominant colour: Green. Security thread: Vertical, solid, narrow. Issuer: Sveriges Riksbank. First Date of Issue: 1963. Artist: Unknown. Legal tender: No. Date of withdrawal: Invalid after 31 December 1998. Material: Cotton paper. Printer: Tumba Bruk. Texts: Sveriges Riksbank. Tio Kronor. Ten Kronor (Crowns).